I had quite a busy weeks with two workshops! Not that I am complaing, I absolutely love workshops... a chance to share Stampin' Up! 's beautiful, coordinating products! What is not to like! This week my focus will be on recruiting and Easter! I aim to recruit two lucky people AND make some tiny Easter gifts for my kid's school teachers! 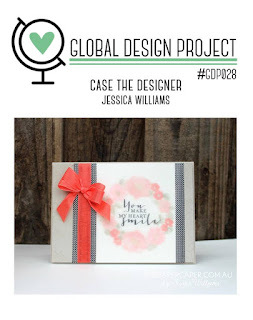 My entry for this week's Global Design Project challenge (we are CASE-ing the designer, Jessica Williams ) is a birthday card that I made for a wonderful mom from my daughter's class! I thought the colours suited her! The layout and the colours from Jessica's card inspired me! Calypso Coral, Basic Black and Gold! I love teaming the Pretty Petals Designer Series Paper Stack with the Typeset Speciality Designer Series paper! Yes, I did heat emboss the Sahara Sand Lace Trim with Gold Stampin' Emboss Powder! Very carefully I might add! With just more than a week left of SALE-A-BRATION (ending the 31st of March '16) to go, I urge you to place those qualifying orders before you miss out! Be careful when heat embossing the Sahara Sand Lace Trim - too long and you will melt it! It gives an Old Gold effect to the lace. Very nice! I always use my Embossing Buddy, but it is especially handy when heat embossing onto Basic Black ( or any dark cardstock)! Nothing nastier than white or gold specks where you don't want them on your projects! I used quite a few Dimensionals underneath my Calypso Coral Die Cut piece to prevent it from sagging in the mail. Well something bold from me this time! I hope you like it! Wonderful card, it is so rich with the colours and the gold. Thanks for playing at GDP this week. Thanks for your comment Teneale! WOW that gold glimmer butterfly - stunning! Love your card Melodie - especially that now gold lace trim! Thank you so much for joining this week's Global Design Project and CASEing me! Thanks for inspiring me Jess! After receiving your beautiful card with the altered ribbon it was easier to think outside the box! So many gorgeous layers on this card, Mel! I love how you've built the butterfly on the inside - smart! Thank you for playing along with this week's CASE the Designer Challenge at Global Design Project - glad you did. I do love a layer (or 2) Brian! Thanks for your comment!